The Dog Island Run gives you a choice of 10K Run or Two Mile Walk and is located on Guemes Island approximately 80 miles north of Seattle. Paid registration includes your choice of a variety of embroidered caps while supplies last. 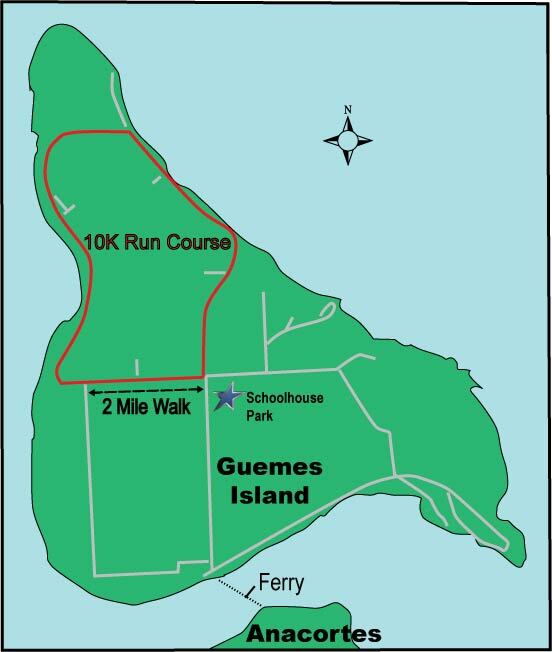 Take a short ferry ride to Guemes Island and we provide a free shuttle bus to the Run site. All proceeds from our event go to benefit our volunteer operated Guemes Island Library. The 10K Course is USATF certified. The course is quite scenic with views of forests, beaches, and the San Juan Islands. Hills keep the run challenging. The Two Mile Walk Event is also available for individuals and family members who want to get in on the fun of the event at a less strenuous pace. Closed Course: No dogs are allowed on the run or walk routes. Strollers are allowed. Awards will be given to the top male and top female 10K finishers. Award ribbons will be given to the top three in each age division (male and female). Prizes from Guemes Island and Anacortes merchants will be distributed based on a random drawing of bib numbers (must be present to win). Water Stations and Porta Potties are located at different points on the 10K and Two Mile Courses as well as at the Park. If you have any questions, send an email to Carol Pellett at cpellett95@gmail.com. From I-5 at Mt. Vernon, take Highway 20 to Anacortes. Highway 20 enters Anacortes on Commercial Avenue heading North. In Anacortes, go North on Commercial Avenue and turn left on 6th Street (heading West). The Guemes Island Ferry terminal is at the intersction of 6th Street and I Avenue. Park in the ferry parking lot or the surrounding neighborhood. Board the ferry as a walk-on passenger (tickets are sold when boarding) for the 8-minute ride across the channel. Free Shuttle Bus: On Guemes Island, a free bus will shuttle you to the starting point of the race at Schoolhouse Park approximately 2 miles from the ferry dock. The free shuttle bus also returns participants and families back to the ferry dock at the end of the event. If you prefer, you can take your bicycle on the ferry and ride to the Park. Catch the 9:15 or 9:45 or 10:15 ferry sailing from Anacortes as walk-on passengers. Do not bring your car across. There is no parking at the race site. Do bring your family for a picnic at the park. Do not confuse the Guemes Island Ferry with the Washington State Ferry which serves the San Juan Islands from another location west of Anacortes. Paid registration includes a variety of embroidered caps, while supplies last. Fill out the registration form and print both pages of the form. Sign under the liability waver. Write a check payable to Guemes Island Library. Our service desk is located at the Schoolhouse Park at the Run site. Cash, Checks or credit card payment on day of race. The race will NOT be chip timed. Refreshments available at end of Run/Walk. Live music and food truck. Prizes from random drawing based on bib numbers will be distributed immediately after completion of the Run. All proceeds benefit the Guemes Island Library. Your participation in the Dog Island Run and tax-deductible contributions are greatly appreciated. The Guemes Island Library is located adjacent to the Community Center on Guemes Island Road. Sponsored by Skagit Runners and Road Runners Club of America. The Guemes Island Library would like to thank these individuals and businesses for their generous contributions to the 2017 Dog Island Run. Walgreens Washington Federal Bank Watermark Book Co.